Matt works for Colorado’s beloved New Belgium Brewing Company. The brewery had just retired their original Oak Cask and Matt wanted wood from it to be inlayed into his wedding ring. After the wedding, relatives called me to say that the ring was the talk of the day! How could there have been a more perfect ring for Matt. 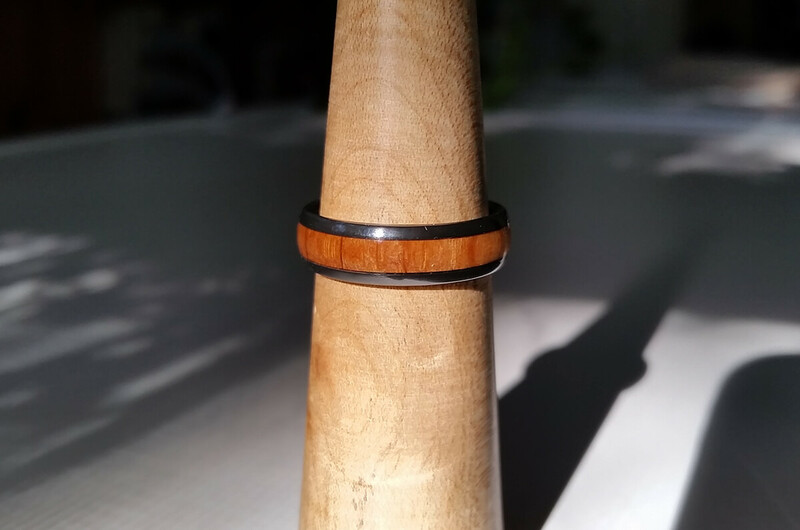 When Matt came in to have his custom wedding ring designed he wanted a black ring with oak inlay. We discussed the durability of his options with black metal and decided on Zirconium as the material for his ring. He brought me a chunk of Oak from New Belgium’s cask and the rest is history!